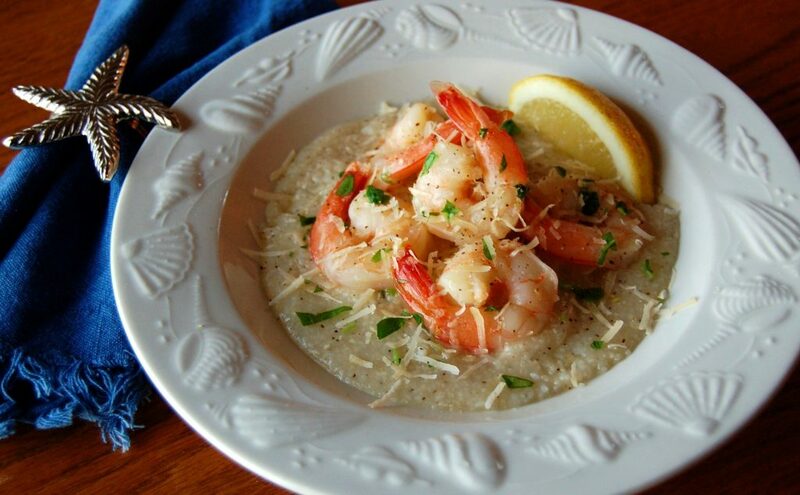 Shrimp sautéed in lemon, butter and garlic, served over a bed of creamy parmesan grits. Bring 3 cups of water to a boil in a medium saucepan over high heat, covered. Uncover and slowly whisk in the grits, 1 teaspoon salt and 1/2 teaspoon pepper. Reduce the heat to medium-low and cook, stirring occasionally, until thickened, about 5 minutes. Stir in parmesan cheese and 1 tablespoon butter. Remove from the heat and season with salt and pepper to taste. Cover to keep warm. Meanwhile, season the shrimp with salt and pepper. Melt the remaining 2 tablespoons butter in a large skillet over medium-high heat. Add the shrimp, garlic and cayenne, if using, and cook, tossing, until the shrimp are pink, 3 to 4 minutes. 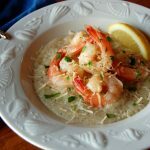 Remove from heat and add 2 tablespoons water, lemon juice and parsley; stir to coat the shrimp with the sauce and season with salt and pepper to taste. Divide the grits among 4 shallow bowls and top with the shrimp and sauce. Serve with lemon wedges.